On Wednesday, April 17, the Community Center for the Performing Arts proudly welcomes Melvin Seals and JGB “Roadrunner Tour” to the WOW Hall. Wasn’t he just here? Yes, he was. Well, Coyote, did you catch him? Melvin Seals, who graced our stage in February with Grateful Dead tribute act Terrapin Flyer, is returning with his own band JGB. And a lot of people wouldn’t be unhappy if he played here every month. They recently voted Melvin the WOW Hall’s Favorite Male Performer for 2018, the third year in a row he has been so honored. JGB is the band founded by Jerry Garcia as a side project in 1975; it remained the most important of his various side projects until his death in 1995. The band regularly toured, and recorded sporadically, throughout its twenty-year existence. Besides Garcia, bassist John Kahn was the only constant. Seals had the next longest tenure, serving as keyboardist from 1980 onward. Adding his rock-gospel-soul-rhythm and blues touch with his funky style of playing, it’s no wonder Jerry nicknamed him "Master of the Universe". Kahn briefly led the group -- rechristened JGB -- following Garcia's death in 1995 and Seals became the bandleader after his death in 1996. He is the only remaining member from the final iteration of the Jerry Garcia Band in JGB. Melvin has been a powerful presence in the music industry for forty years with a long-established reputation as a performer, recording artist and producer. He is most revered for his powerful, high-spirited Hammond B-3 organ playing. Melvin spun his B-3 magic with the Jerry Garcia Band for 18 years and in doing so helped pioneer and define what has now become "Jam Band Music". From blues to funk to rock to jazz, he serves up a tasty mix with a little R&B and gospel thrown in to spice things up. Today, Melvin and JGB bring an intuitive, expressive style plus soul, spontaneity and remarkable chops to the table. With acoustic and electric ingredients and unique combinations of Zach Nugent’s guitar and vocals, John-Paul McLean's savory bass, Pete Lavezzoli’s hearty drums and, of course, a heapin' helpin' of the wizard's magic on Hammond B-3 organ and keyboards. Along with Sunshine Becker and Lady Chi on back-up vocals, the result is a most satisfying blend of natural organic grooves that challenges genre boundaries. Their chemistry is the focus from which the band members create a spontaneous and high art where the sky is the limit. They offer an exciting, often psychedelic musical journey that changes nightly and keeps the audience dancing and smiling (and some staring in amazement) for hours. 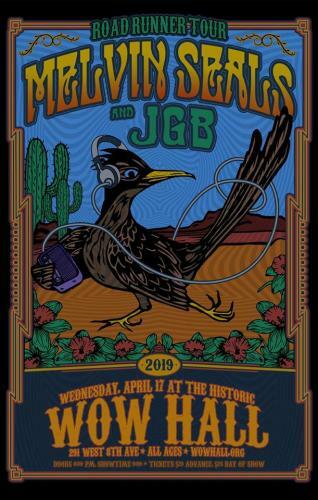 Melvin continues to treat music lovers to his unique brand of melodic flavor with JGB. If you didn’t catch him here last time (or if you did), be like the wily coyote and try again. Tickets are $23 in advance, $25 day of show. Doors open at 8:00 pm and showtime is 9:00.